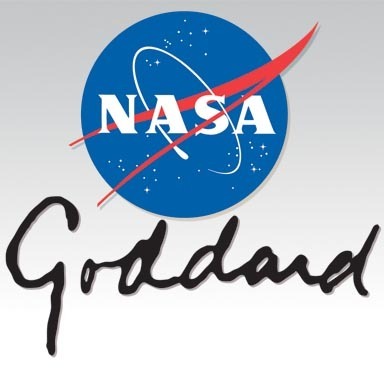 NASA — Goddard Space Flight Center logo. A NASA scientist’s final scientific paper, published posthumously this month, reveals new insights into one of the most complex challenges of Earth’s climate: understanding and predicting future atmospheric levels of greenhouse gases and the role of the ocean and land in determining those levels. A paper published in the Proceedings of the National Academy of Sciences was led by Piers J. Sellers, former director of the Earth Sciences Division at NASA’s Goddard Space Flight Center, who died in December 2016. Sellers was an Earth scientist at NASA Goddard and later an astronaut who flew on three space shuttle missions. The paper includes a significant overarching message: The current international fleet of satellites is making real improvements in accurately measuring greenhouse gases from space, but in the future a more sophisticated system of observations will be necessary to understand and predict Earth’s changing climate at the level of accuracy needed by society. Sellers wrote the paper along with colleagues at NASA’s Jet Propulsion Laboratory and the University of Oklahoma. Work on the paper began in 2015, and Sellers continued working with his collaborators up until about six weeks before he died. They carried on the research and writing of the paper until its publication this week. The paper focuses on the topic that was at the center of Sellers’ research career: Earth’s biosphere and its interactions with the planet’s climate. In the 1980s he helped pioneer computer modeling of Earth’s vegetation. In the new paper, Sellers and co-authors investigated «carbon cycle–climate feedbacks» – the potential response of natural systems to climate change caused by human emissions – and laid out a vision for how to best measure this response on a global scale from space. Animation above: From space, satellites can see Earth breathe. A new NASA visualization shows 20 years of continuous observations of plant life on land and at the ocean’s surface, from September 1997 to September. 2017. On land, vegetation appears on a scale from brown (low vegetation) to dark green (lots of vegetation); at the ocean surface, phytoplankton are indicated on a scale from purple (low) to yellow (high). 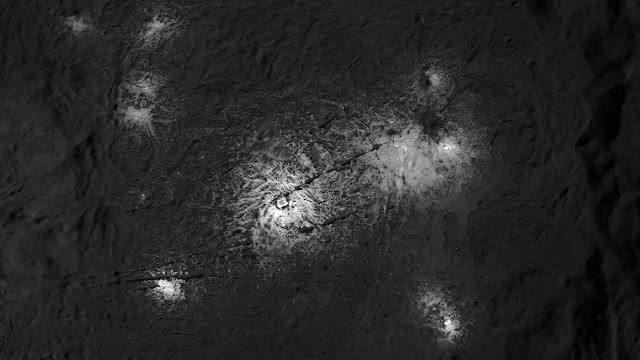 This visualization was created with data from satellites including SeaWiFS, and instruments including the NASA/NOAA Visible Infrared Imaging Radiometer Suite and the Moderate Resolution Imaging Spectroradiometer. Image Credit: NASA. The exchange of carbon between the land, ocean and air plays a huge role in determining the amount of greenhouse gases in the atmosphere, which will largely determine Earth’s future climate. But, there are complex interactions at play. While human-caused emissions of greenhouses gases are building up in the atmosphere, land ecosystems and the ocean still offset about 50 percent of all those emissions. As the climate warms scientists are unsure whether forests and the ocean will continue to absorb roughly half of the emissions – acting as a carbon sink – or if this offset becomes lower, or if the sinks become carbon sources. Paper co-author David Schimel, a scientist at JPL and a longtime scientific collaborator of Sellers’, said the paper captured how he, Sellers and the other co-authors saw this scientific problem as one of the critical research targets for NASA Earth science. «We all saw understanding the future of carbon cycle feedbacks as one of the grand challenges of climate change science,» Schimel said. Scientists’ understanding of how Earth’s living systems interact with rising atmospheric levels of greenhouse gases has changed tremendously in recent decades, said co-author Berrien Moore III, of the University of Oklahoma. Moore has been a scientific collaborator with Sellers and Schimel since the 1980s. He said that back then, scientists thought the ocean absorbed about half of annual carbon emissions, while plants on land played a minimal role. Scientists now understand the ocean and land together absorb about half of all emissions, with the terrestrial system’s role being affected greatly by large-scale weather patterns such as El Niño and La Niña. Moore is also the principal investigator of a NASA mission called GeoCarb, scheduled to launch in 2022, that will monitor greenhouse gases over much of the Western Hemisphere from a geostationary orbit. NASA launched the Orbiting Carbon Observatory-2 (OCO-2) in 2014, and with the advancement of measurement and computer modeling techniques, scientists are gaining a better understanding of how carbon moves through the land, ocean and atmosphere. This new paper builds on previous research and focuses on a curious chain of events in 2015. While human emissions of carbon dioxide leveled off for the first time in decades during that year, the growth rate in atmospheric concentrations of carbon dioxide actually spiked at the same time. This was further evidence of what scientists had been piecing together for years – that a complex combination of factors, including weather, drought, fires and more, contributes to greenhouse gas levels in the atmosphere. Video above: In a 2016 interview, Piers Sellers talked about his enthusiasm and appreciation for working at NASA’s Goddard Space Flight Center. 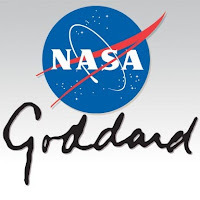 Video Credits: NASA Goddard. However, with the new combination of OCO-2 observations and space-based measurements of plant fluorescence (essentially a measure of photosynthesis), researchers have begun producing more accurate estimates of where carbon was absorbed and released around the planet during 2015, when an intense El Niño was in effect, compared to other years. The paper follows a report from a 2015 workshop on the carbon cycle led by Sellers, Schimel, and Moore. Schimel and Moore both pointed out that every one of the more than 40 participants in the workshop contributed to a final scientific report from the meeting – a rare occurrence. They attributed this, in part, to the inspirational role Sellers played in spurring thought and action. Schimel and Moore said the workshop paper lays out a vision for what’s needed in a future space-based observing system to measure, understand, and predict carbon cycle feedbacks: active and passive instruments, and satellites both in low-Earth and geostationary orbits around the world. In the coming years, NASA and space agencies in Europe, Japan, and China, will all launch new greenhouse-gas monitoring missions. Animation, Video. Text, Credits: NASA/Sara Blumberg/Goddard Space Flight Center, by Patrick Lynch. 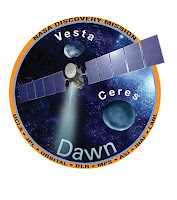 NASA — Dawn Mission patch. 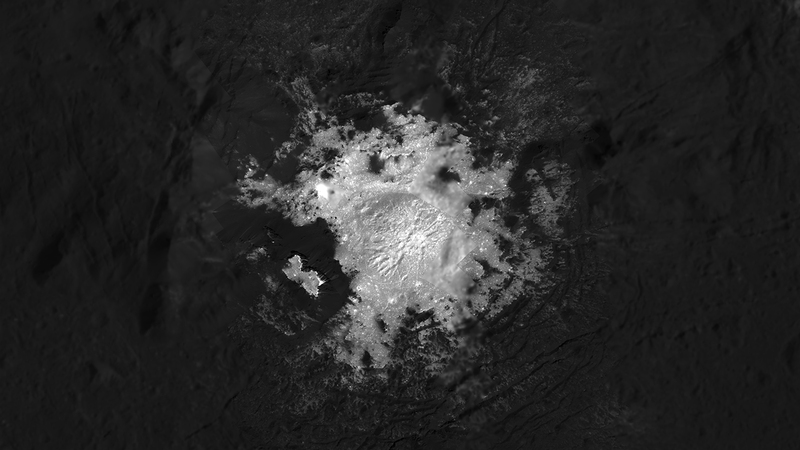 Image above: This mosaic of Cerealia Facula in Occator Crater is based on images obtained by NASA’s Dawn spacecraft in its second extended mission, from an altitude as low as about 21 miles (34 kilometers). Image Credits: NASA/JPL-Caltech/UCLA/MPS/DLR/IDA. As NASA’s Dawn spacecraft prepares to wrap up its groundbreaking 11-year mission, which has included two successful extended missions at Ceres, it will continue to explore — collecting images and other data. Image above: This close-up image of the Vinalia Faculae in Occator Crater was obtained by NASA’s Dawn spacecraft in its second extended mission, from an altitude as low as 21 miles (34 kilometers). Image Credits: NASA/JPL-Caltech/UCLA/MPS/DLR/IDA. 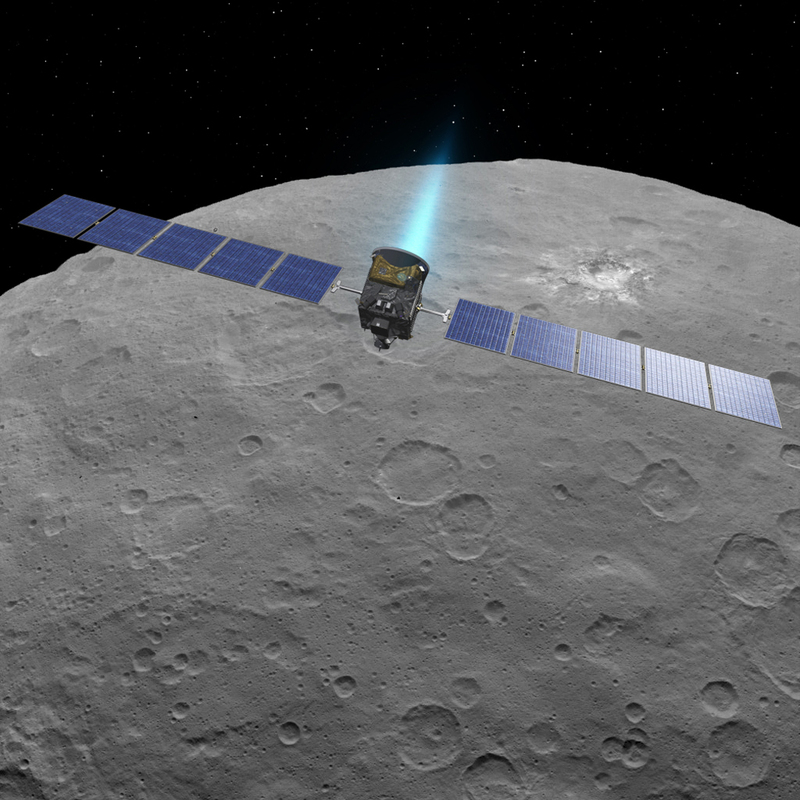 These days, near the end of Dawn’s second extended mission at Ceres, the spacecraft continues to wow us week after week, with very close photos shot from only 22 miles (35 kilometers) above the dwarf planet — about three times the altitude of a passenger jet. Images (mentioned), Text, Credits: NASA/Dwayne Brown/JoAnna Wendel/Tony Greicius/JPL/Gretchen McCartney. NASA — Spitzer Space Telescope patch. 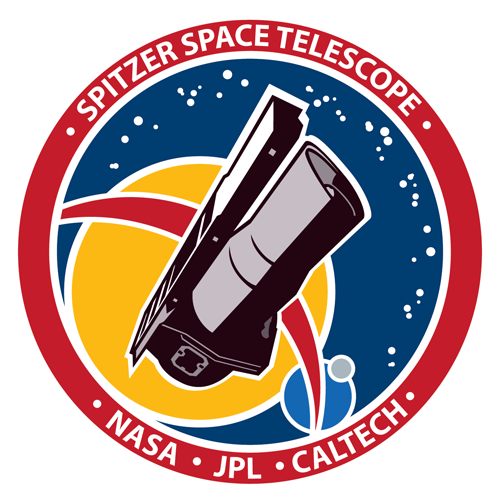 Launched nearly 15 years ago on August 25, 2003, the Spitzer Space Telescope is the final mission in NASA’s Great Observatories Program — a family of four space-based observatories, each observing the universe in a different kind of light. The other missions in the program include the visible-light Hubble Space Telescope, Compton Gamma-Ray Observatory, and the Chandra X-Ray Observatory. Over the years, Spitzer, which makes observations in the infrared spectrum, has made a plethora of discoveries, including this detection of the faint afterglow of the explosive merger of two neutron stars in the galaxy NGC 4993 on September 29, 2017. 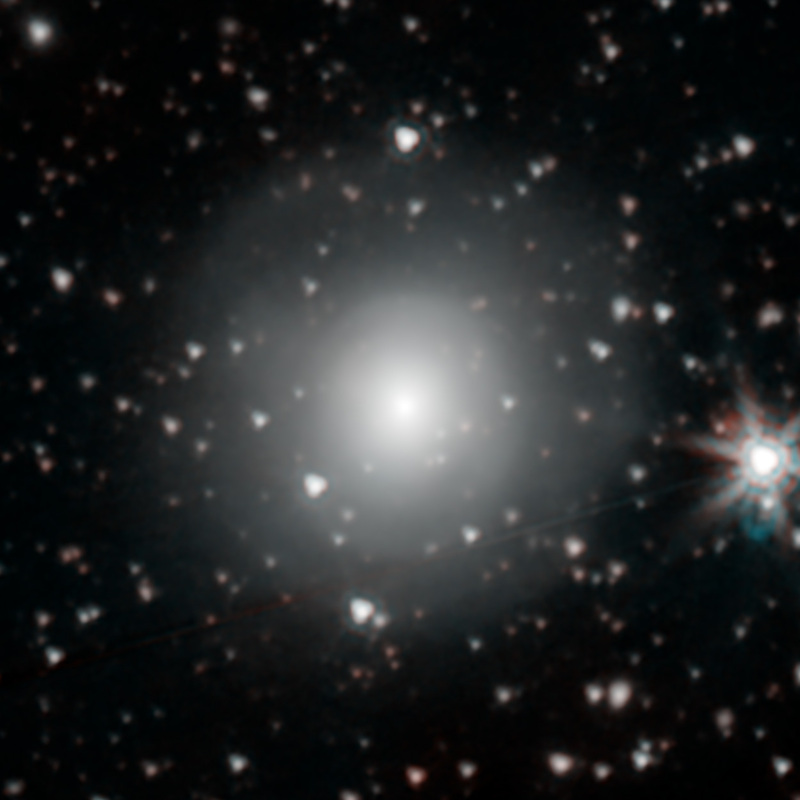 The event, labeled GW170817, was initially detected nearly simultaneously in gravitational waves and gamma rays, but subsequent observations by many dozens of telescopes have monitored its afterglow across the entire spectrum of light. Spitzer’s observation came late in the game, just over six weeks after the event was first seen, but this played an important role in helping astronomers understand how many of the heaviest elements in the periodic table are created in explosive neutron star mergers. The telescope was named after Lyman Spitzer, Jr. (1914-1997), one of the 20th century’s great astrophysicists, who made major contributions in the areas of stellar dynamics, plasma physics, thermonuclear fusion, and space astronomy. He was laos the first person to propose the idea of placing a large telescope in space and was instrumental in the development of the Hubble Space Telescope. Image, Animation, Text, Credits: NASA/Yvette Smith/JPL-Caltech.